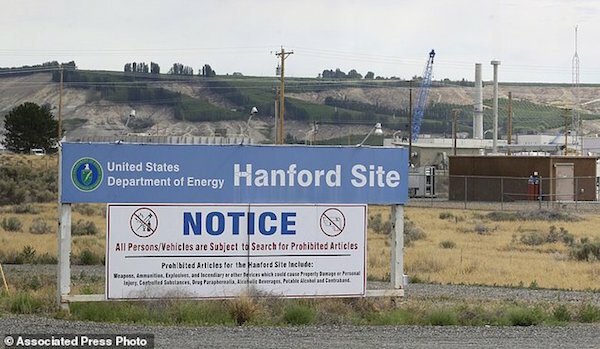 A portion of a storage tunnel that contains rail cars full of radioactive waste collapsed Tuesday morning, forcing an emergency declaration at the Hanford Nuclear Reservation in southeastern Washington state. Officials detected no release of radiation and no workers were injured, said Randy Bradbury, a spokesman for the Washington state Department of Ecology. There were no workers inside the tunnel when it collapsed. But nearby Hanford workers were evacuated and others who were farther away were told to remain indoors, the U.S. Department of Energy said. The accident occurred at a facility known as PUREX, located in the middle of the sprawling Hanford site, which is half the size of Rhode Island, Bradbury said. Hanford is located near Richland, about 200 miles southeast of Seattle. The closed PUREX plant was part of the nation’s nuclear weapons production complex. Hanford for decades made plutonium for nuclear weapons and is now the largest depository of radioactive defense waste that must be cleaned. It contains about 56 million gallons of radioactive waste, most of it in 177 underground tanks. Bradbury said the collapse occurred at one of two rail tunnels under the PUREX site. In the past, rail cars full of radioactive waste were driven into the tunnels and then buried there, he said. Hanford has more than 9,000 employees. The site was built during World War II and made the plutonium for most of the U.S. nuclear arsenal, including the bomb dropped on Nagasaki, Japan, at the end of the war.